Your concept. Our knowhow. Right here. Right now. Unionwear can make any type of sewn headwear, bag, binder, or portfolio Send us your product and logo designs and we will help re-engineer them so we can meet your expectations of cost without sacrificing the integrity of your designs. You can also pick one of our dozens of popular (or thousands of unpopular) bag and hat patterns and just choose colors and trims like handles for bags or closures for caps. We do stock the most popular styles of hats blank as well. After settling on price, guaranteeing a delivery date, and getting a purchase order, we prototype the products and stitch out the logos on new designs when necessary, or just have clients sign off on a long list of specifications on our regular patterns. Fabric and materials are ordered, goods are cut, and are generally embroidered before sewing begins to keep costs low and quality high. A few weeks later, your finished product is subject to rigorous quality inspection and shipped to you or drop shipped to your clients. Tell us what you want and when you want it and give us a budget. We’ll make it happen. Domestic manufacturers have had to evolve to survive. 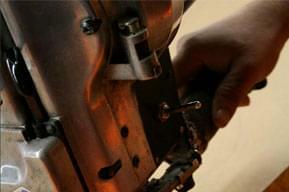 Unionwear continuously re-engineers our products so we can manufacture locally without sacrificing clients’ profits. During the peak cheap import era there was no attention paid in China to the amount of labor that went into a product. These designs and habits continue even though labor costs are skyrocketing but domestic manufacturers have decades of experience developing techniques that help achieve the integrity of customers’ designs and functionality and still stay within their budgets. We often expect to undergo several rounds of sampling during product development, which is much easier with domestic manufacturers. For the first time in twenty years, you can actually reduce costs by manufacturing some products or assembling parts of your products domestically. We look for bulky products made from expensive fabrics in quantities large enough to build a dedicated, lean manufacturing production line, but not so large that China is turning them out by the millions. Domestic manufacturers can compete by making sure that every minute working is spent creating value. The only way a manufacturer can create value is by making improvements to raw materials that clients are willing to pay for. 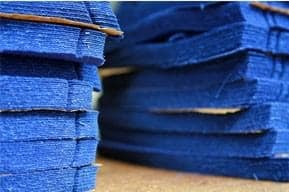 In the garment industry, value is created by cutting and sewing fabric, and decorating finished product. Manufacturers can’t create value by lowering labor costs or building up piecework inventory. Piecework has no value until customers are willing to pay for the finished product. Sewing a shirt is creating value–you are adding value to the fabric. The work done finding, collating, collecting, counting, cleaning, unpacking, carrying, and returning the cones of thread used to sew this shirt is “Non Value Added Work”. It’s an investment with no return and the worker worked just as hard not adding value as he would have if he were sewing. Lean manufacturing means eliminating all non value added work to lower costs, lower prices, and improve delivery times. Unionwear underwent a lean transformation from 2006 through 2008 is featured on the US Department of Commerce’s web site as a lean manufacturing success story. In house embroidery before production actually makes the finished product competitive with imports. Unlike most cap embroiderers, Unionwear embroiders the front panels of our caps and bags on a flat surface before these products are made rather than on the curved surface of a finished products. This saves up to 50% on costs and results in a larger embroiderable area, no registration problems, and a greater facility with detail. 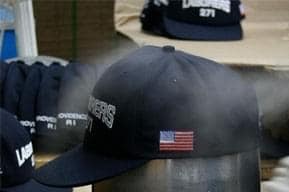 This also allows Unionwear to embroider products generally considered unembroiderable: The top of a plastic baseball cap visor. The pocket of a tote bag. The front of a leather portfolio folder. Embroidery prices depend on the actual number of stitches it takes to duplicate your design, not on the number of colors. All baseball caps listed unionwear.com are priced to include up to 4,000 stitches. For an estimate, please fax or email artwork. There is a one time set up fee to digitize custom artwork. Simple text can usually be done for nominal fee. Final cost is determined by the number of stitches in the embroidery. If you cannot provide your artwork on disk in Tajima format (.dst file), or via e-mail programmed for embroidery stitch length, density, color, direction and type, you must have it digitized. If you do not have your artwork in either of the above mentioned formats, you must submit a .jpg or .pdf with color info. Artwork is considered to be unembroiderable if it contains any shading, color gradation, text smaller than .25″ (.375″ w/serifs), or detail that can’t be duplicated with a standard Sharpie Marker. To avoid minimize charges search for your logo to see if we already have it digitized, or use our embroidery clip art.